Damp places like tiled floors in baths tend to see a lot of stains develop over time. Steam cleaning can reduce the gunk without the need for toxic chemicals. We cover the latest steam mop from the firm that invented these tools, in our Light ‘N’ Easy steam mop review. With steam cleaning, you can get things in shape at low cost. This floor model’s upright design features a soft grip and an ergonomic lightweight housing that handles with little physical effort. It provides the cleaning power of hot steam wherever it is needed around the house. Does this steam mop offer a good balance between portability and effectiveness? Read on about the things we liked or not. Product Description: Super lightweight mops less than 4 pounds with a swiveling mop head to allow easy handling with little physical effort. With the help of instant heating, it could be begin to work within 20 seconds. Wide mop head. Narrow mop heads have to make multiple passes to clean the same area, which can result in missed applications as the user tires out. The wider head helps cover more ground. Hot steaming. The unit steams with temperatures of 175°F and is at full temp in about 20 seconds! Cost. This steam mop is reasonably priced for what it provides. However, for handling many large jobs, professional-grade steam cleaners can be more economical to run over many years. Boiler capacity. Compact units like this have smaller tank volumes than larger professional models but are easier to transfer between different floors. Warranty. Only a 1-year manufacturer’s warranty. Boiler parts are notorious for inconsistent factory quality, so it pays to shop from sellers that offer extended warranties or utilize Amazon’s Buyer Protection plans. Grout around bath tiles is porous and becomes slimy as gunk accumulates and hardens over time. The stuff can be tough to remove, even vigorous brushing with wire bristles might not be enough. Many homeowners resort to steaming cleaning to dissolve and flush stains on hard floors. The method also offers a natural means of managing the dust and grime that can build up on laminate flooring. Although the occasional spill can be managed, too much wetness will eventually lead to internal damage. Steaming can work here, but be aware that high-pressure steam produced by commercial carpet steamers can get past the lines and in-between the laminate layers. A steam mop is the safer option for use on such floors. Read more about steam cleaning laminate floors and how to clean them correctly. The smaller amounts of moisture left in place does not damage laminate boards as readily as the copious streams generated by conventional wet mops and carpet steam cleaners. As long as steam does not force its way through the seams and forms no condensation, steam mopping should be fine. Most parents take quickly to its regular use, for steam mopping tidies up and sanitizes bath floors and counters with no need for detergents and other chemicals that can be harmful to children. Mop heads generally feature plastic nozzle ends, to which microfiber or other fabric padding is attached. Steam streams down through both the nozzle and pad. Dust and slime on the floor is dissolved and lifted up by the damp fibers. Since only small amounts of water are used, any wetness is promptly absorbed, with most surfaces drying in less than a minute. It is the combination of heat, mist, and streaming vapor that generates the cleaning effect, which the triple-layer pad evenly distributes. Users will still have to scrub off the worst stains by hand, though. You could always try renting a professional-grade steamer, to first check how steaming works. One good alternative are dry-type microfiber mops, which lift dirt and polish floors with little need for water. Daily cleaning dry mopping is generally safest for wooden and laminate floors, with only the occasional steam cleaning to help out on tougher jobs. 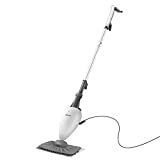 Light ‘N’ Easy’s upright steam mop is constructed mostly of plastics, but seems well-made for a lightweight floor model. Weight is just under five pounds, so the entire unit readily stores in tall closets after jobs. Operation is simple enough. Users only have to top up the boiler with water then switch it on to produce steam continuously, without need of manual pumping. The 20-foot cord may not have long enough reach in larger homes, though. The unit is small but powerful enough to produce steam with temperatures of about 175 degrees Fahrenheit, which kills 99% of all microbes when used properly. With a 20 second heat up time, you’ll be off and steaming in short order. We found that many users had trouble with this this steam mop when it came to tougher stains. The problem seems to be in the microfiber that’s included. Users felt that it was difficult to scrub off tough stains and that the microfiber lacks deep cleaning abilities. We would recommend a spot clean prior to steaming if you think an area will become an issue. There are one or two inconveniences though, depending on the amount of cleaning to be done. The problem is the small tank, which stores only 7.04 ounces, this is just enough for about 10 minutes of steam cleaning at any one time. A bigger volume of ready water would have allowed for longer cleaning sessions between refills. Users will also have wait for things to cool down before water can be replenished, then pause again as the boiler produces more steam. Tip: The microfiber pad slips on snugly enough, but a washcloth tied to the end with rubber bands will work just as nicely. The Light N’ Easy steam mop is a compact but easy-to-use floor model that steams with enough power to cleanse and sanitize most trouble areas. Its capacity should suit most homeowners with smaller areas to maintain. For the largest jobs, the small tank can be something of a letdown, though. The manufacturer has a long history, but this design obviously trades tank capacity and operating time for good power and portability. 【light & easy steam mop】 Super lightweight mops less than 4 pounds with a swiveling mop head to allow easy handling with little physical effort. With the help of instant heating, it could be begin to work within 20 seconds. Only to move it, it could begin releasing steam, then faster you move, the more steam it release, and stop releasing steam when you stop to move it. And the floor also dry within 30 seconds. 【Heathy and Friendly 】 Eliminates 99. 9 Percent of germs and bacteria with the natural power of steam. Clean and sanitize sealed powerful stains without the use of harsh chemicals. Only use the pure water, you don't need to buy chemicals cleaner, Good for you, you family and pets. 【Multifunction steamer mop for all floors】 suitable for all kinds of floors as multifunction steam mops, such as tile floor mop, grout floor mop , laminate floor mop, engineered hardwood floor mop, carpet mop, vinyl floor mop , stone floor mops. . . could remove the oil stain, milk stain, coffee stain and so on. 【Washable Pads】1 washable microfiber pads which also could be replaced, no more messy mops and heavy buckets. Please note carpet Gilder (search "B07D371V1T")which need additionally purchase could removes carpet odor easily. Does the Shark Steam Pocket Mop Pack Enough Power for Your Home? this mop doesn’t heat up to produce steam. It does dampen the floor but does not clean. Is something wrong with my unit? Yes, It should be producing steam. I would contact the seller for troubleshooting or a replacement.